Kellari Taverna is a squeeze of fresh lemon on an otherwise uninspired strip of restaurants on K Street. Their fresh fish display, giant cheese wheel perched on the bar and the grab-n-go cookies by the door are just a selection of the touches of authenticity at this expansive Greek seafood spot. 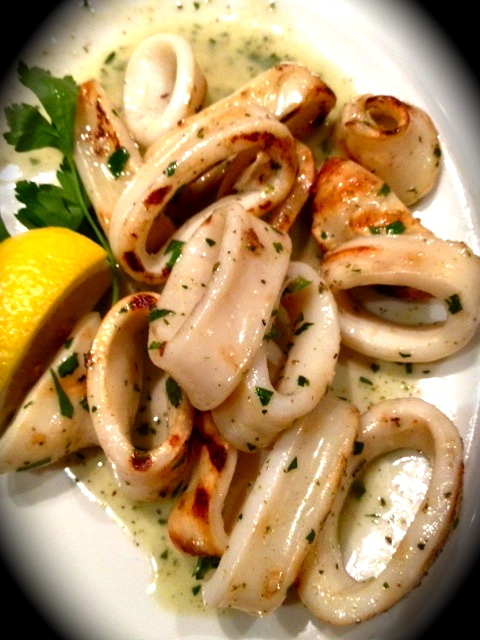 Whether for business lunch or pre-theatre dinner, Kellari’s Best Thing on the Menu: Calamari, Lightly Grilled will likely appear on all tables. We have chosen to emphasize “Lightly Grilled” because there is also a fried option. With calamari this fresh, frying would be a crime punishable by having to eat a Wendy’s fish sandwich. These are the largest rings ever encountered in years of calamari-eating adventures. Who knew they could get so big? In searching for more information, we came across this gem of a video of a giant squid in its natural habitat from our friends at NBC and NHK News Japan. Apparently, the colossal squid can reach measurements of 39–46 ft. long. Calamari from these Kraken-like cephalopods would likely produce calamari rings you could hula-hoop with. Kellari Taverna’s fare is extremely fresh. The restaurant had prioritized farm-to-table procedures and selecting top indigents long before it was trendy. Another fun fact, Kellari Taverna can be found on seamless, so you can get the BTM delivered to your house. A source says they often send an actual waiter wearing his bow tie as the delivery guy. Calamari, Lightly Grilled not your BTM? Post your favorites in the comments section. This entry was posted in Restaurants and tagged Best Thing on the Menu, BTM, Calamari, Kellari Taverna, Seafood. Bookmark the permalink.